We're nearing the end of August, Summer holidays almost over and I can't believe I only just found out about the Mythical Maze Summer reading challenge. Good job we decided to visit the library last week!! Is this something your children have been joining in with?? Talking of challenges I'm only 18 books away from completing my Goodreads 2014 reading challenge. I've read 132 books so far this year. My favourite book from last week had to be Ugly Love from Colleen Hoover, I don't think this woman can write a bad book!! Some brilliant posts linked up last week, a big thank you to everyone who took the time to link up and comment. A couple of my favourites, a beautiful poem about planting the seed of reading from The Uncheshire Wife. And a great review of Making It! by Mollie Makes from Jenny over at The Gingerbread House. 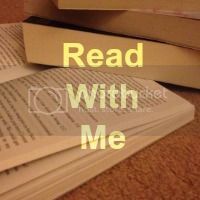 If you happen to be new to #readwithme have look here at just what this linky is all about. Everyone else, lets getting linking up. Please take the time to comment on a couple of other posts and as always a link back or dispalying my badge is very much appreciated. Thanks for hosting; I've linked up one of my favourite books from this year. 312 books is impressive! I used to keep a list of the books I read at the back of my diary each year but this year I haven't... Thinking perhaps I will next year - though I doubt I'll get to 132!